Whilst wrapped-up under the duvet on a public holiday with a glass of red wine and watching a dvd, I was wondering what I felt like to eat. Jade de Waal’s twitter came through with a recipe for mielie fritters (Jade is an extraordinary wonderful woman that is currently in the Top 13 in Masterchef SA). That little tweet took me back to my moms’ “mielie brood” (mealie bread) that we used to gobble down with lots of golden syrup. My mind then next teleported me to the place where I had fallen in love with Maple syrup … New York…! Oh my word, how I love maple syrup! That amazingly, beautiful, golden sticky, earthy, sweet syrup stole my heart (as did New York…). At that moment I knew I wanted Jade’s Mielie Fritters with my maple syrup!! I really love mixing sweet and savoury and immediately started cooking. To say the least – it was YUMMY and the chopped spring onion complimented the Maple syrup in such a profoundly earthy way! In cold climates, these trees store starch in their trunks and roots before the winter; the starch is then converted to sugar that rises in the sap in the spring. Maple trees can be tapped by boring holes into their trunks and collecting the exuded sap. The sap is processed by heating to evaporate much of the water, leaving the concentrated syrup. So here is Jade’s recipe – she serves it with a green avocado salsa and/or sweet chilli sauce – delish! Mix all the ingredients for the fritter in a bowl. At first the batter will look dry, but keep mixing until the ingredients come together. Heat about 2 tablespoons of olive oil in a medium frying pan. Turn down to medium so the oil is not too hot, otherwise the outside of the fritter will burn whilst the inside is still raw. Spoon a tablespoon scoop of the batter in the oil, frying about 2-3 at a time for 2 minutes on each side or until brown. Meanwhile chop and mix the ingredients for the salsa in a bowl. 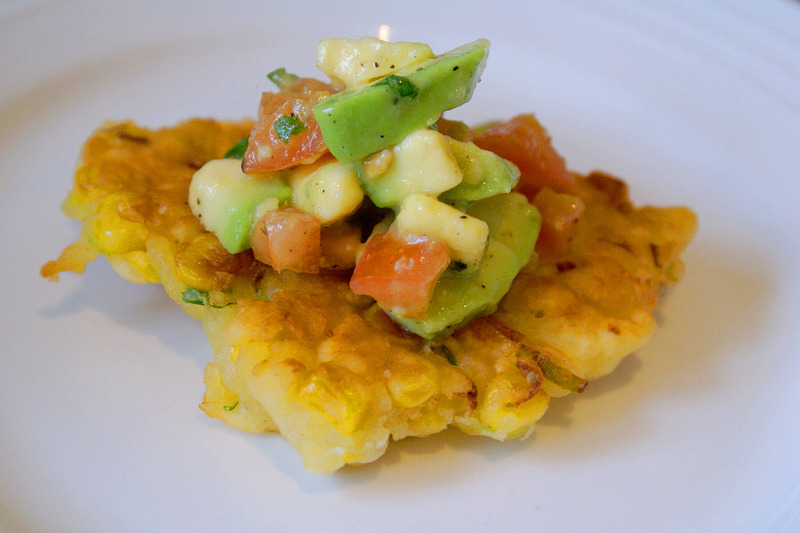 Test the first fritter by cutting in half to make sure they're cooking through. When all fritters are done, spoon the salsa over to serve perhaps with the sweet chilli sauce on the side to dunk the fritters in or … as I did smother the fritters with golden maple syrup. Bon appétit! Thanks for the feedback Mary. I found that i needed to add a little bit of milk with the batter.